The speech and oath at the inauguration ceremony of the first President of Russia Boris Nikolayevich Yeltsin on July 10th, 1991 by the Constitution of RSFSR (the Russian Soviet Federative Socialist Republic) and the oath of the President of Russia on August 9th, 1996 by the Constitution of Russia of 1993 (60 х 91 mm, Moscow, the Presidential Administration of Russia, 2000); the edition of 50 copies. B.N. 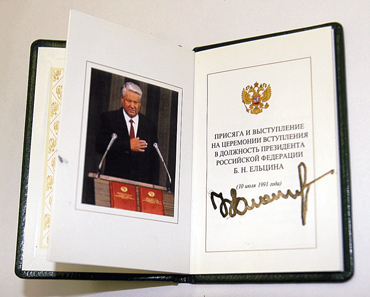 Yeltsin’s Autograph. The Mystery of the World’s Calligraphy exhibition was rapidly held (six days only) at the premises of the Contemporary Museum of Calligraphy located in Sokolniki. The event was organized by MVK, the International Exhibition Company and the National Union of Calligraphers (Alexey Shaburov, project’s director). The exhibition featured works of many calligraphy schools all over the world: China, Japan, Mongolia, India, Turkey, Armenia, the United States of America, Iran, Syria, Palestine, Israel, Jordan, Brazil, Finland, Norway, Germany, Italy, France, Belgium, Holland, Belarus, Ukraine and Russia. So, where is the connection between the ancient art of beautiful handwriting and the Constitution? Among the exhibits there is the handwritten copy of the Constitution of the Russian Federation of 1993 executed in a large format (A2). The masterpiece is a brainchild of Pyotr Chobitko, Head at the presidium of the National Union of Calligraphers, Professor of the Graphic Arts Department of I.E. Repin State Academic Institute of Painting, Sculpture, and Architecture of St. Petersburg, Member of the Union of Artists of Russia. He has been working on the handwritten Constitution all alone for about five months (although, his assistants helped him in the sheets of paper ruling). Yaroslav Kostyuk, bibliophile, Member of the Miniature Book Society Inc. (MBS) unfolded a small part of his collection on seven stands nearby. Today’s collection includes over three thousand samples of books in miniature (less than 10 cm), micro books (less than 1 cm) and ultra micro books (less than 1 mm!). He has mainly selected constitutions, inauguration speeches and oaths of presidents of different countries for the exposition. There are some handwritten masterpieces among side the mini books presented. For instance, the Little Canon, Troparion (50х80 mm, 1801-1825) and the Church Calendar (55x82 mm, 1832), both of the texts are executed in the Cyrillic alphabet and Old Slavic. It turns out to be that from the very beginning the Soviet Government took pains to support traditions of the main books in miniature making. Thus, the miniature (35x51 mm) of the Constitution of the RSFSR of 1918 was published in 1921 in Kineshma. The miniature (38х55 mm) of the Constitution of the RSFSR of 1936 was published by the Partizdat Publishing House in twenty million copies. After that, this kind of thing happened to be much more rarely, which, however, is better for collectors. The speech and oath at the inauguration ceremony of the first President of Russia Boris Nikolayevich Yeltsin on July 10th, 1991 and on August 9th, 1996 are printed only in fifty mini copies. It is difficult to say if the current Constitution is to be amended in the future or not and how many times it might happen. But the uncorrected Constitution of Russia of 1993 which celebrated its 15th anniversary will remain at the Contemporary Museum of Calligraphy and be stored for history at least as a work of art. Afterwards, if amendments are to be made, the masterpieces will stay precious anyway.